It was a packed house on Day 1 in the GSG booth at ISPS EXPO! 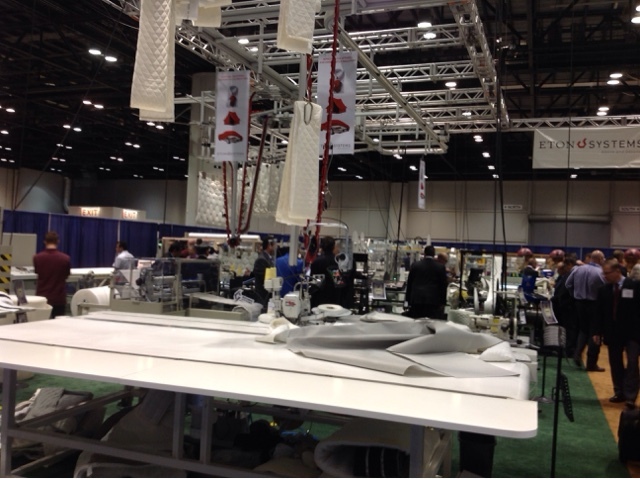 There was new mattress manufacturing equipment filling the booth the rafters - literally! GSG is partnering with ETON SYSTEMS in the mattress industry to help you make a more efficient, more profitable workflow. The system in the booth automatically retrieves quilted panels from the panel cutter behind Gribetz quilters, carries it overhead to the Porter EST-501 flanger, and then carries it all to a tape edge operation. We're raising the roof - well at least the factory floor is being raised - in the GSG booth at ISPA EXPO!